This sophisticated twist on a childhood favorite makes an ideal wintertime feast. Posted by Aurum Press • Published 20th November 2013 • See Aurum Press's 73 projects » © 2019 Valentina Sforza / Aurum Press · Reproduced with permission. · 500 Pasta Dishes by Valentina Sforza, published by Apple Press, £9.99 Hardback. 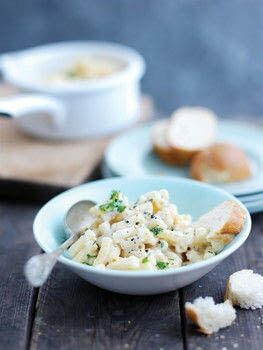 All photos © Quintet Publishing Ltd.
Bring a large saucepan of salted water to a rolling boil, then add the macaroni and cook until al dente. Meanwhile, put the cubed Gorgonzola in a pan with the milk and cream and heat gently over a low heat to melt the cheese, stirring frequently. Mix the parsley into the Gorgonzola sauce, and season with a little freshly ground black pepper. Drain the pasta and tip it into the pan with the sauce, mix together, and serve at once.